Compatible with ImmersionRC , Fatshark , Boscam and DJI Frequencies. NEW UPDATED MODEL WITH Internal Lipo ,HDMI Input and also ability to zoom on screen . 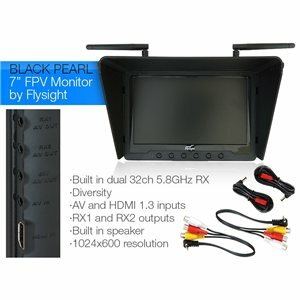 This monitor is the ultimate solution to FPV First Person View Flying as it can receive any channel on the 5.8Ghz fpv band. Now comes with a 1100mah 3s In built lipo (we still recommend using external lipo if you wish to use for prolonged periods of time as the inbuilt lipo is good for approx 1hr - 1.5hr. All in One Compact Unit ideal for the serious FPV flyers . We at Quadcopters and all the staff personally use this monitor ourselves so be assured this is the monitor to have. Pls check frequency compatibility with your Video Transmitter. 13. Working temperature: -10?~+ 65 ? Lipo charger also included for the internal battery.